Griffin Labs has created a phone specifically for people who have had a laryngectomy (removal of the larynx or voicebox) called the TeliTalk Electrolarynx Phone. This phone is a standard landline Panasonic Corded Phone with an electrolarynx wired to it. The electrolarynx is a small handheld device that vibrates to help a person with a laryngectomy create speech. It works by placing the device under the chin or on the cheek and mouthing or articulating the words the individual wishes to speak. Please see the video at the end of this blog showing how an electrolarynx works. This specialized electrolarynx phone can be used with a traditional handset, a headset, or speakerphone. It also has Bluetooth allowing for it to be connected to a cell phone. 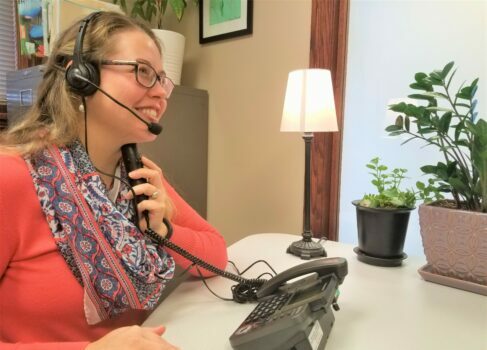 The TeliTalk is only available through State Telecommunication Equipment Distribution Programs such as ND Assistive’s Specialized Phone Program. Select smart and basic phones can be set to TTY Mode (Text Telephone Mode), and in some cases, they can also be set to Hearing Carry-Over. This allows an individual to directly interface with the telecommunications relay system and use a relay operator to help them with their call. The settings for TTY mode are in a different place on each phone. For example, on my Samsung Note 8, they are located within the phone app. I found these directions on the Verizon website. If you are having difficulty finding the directions for your phone, you can do a Google search like “how to turn on TTY Mode Galaxy Note 8”, or you can contact ND Assistive for help. Standard landline TTY devices are still available to connect to the telecommunications relay system directly. These can be obtained at no charge for those who qualify via the ND Assistive Specialized Phone Program or purchased from companies such as Harris Communications. In July 2018, we discussed several other phone solutions for speech difficulties in our blog. We covered topics such as Texting and 911, communication devices and phones, and Speech-to-Speech Relay. This article can be accessed on this webpage. If you have questions or would like an application for our Specialized Phone Program, please see the website or contact us at 1-800-895-4728 or info@ndassistive.org. Jeannie Krull is the Program Director for ND Assistive (formerly IPAT). She is an ASHA certified speech/language pathologist and a RESNA certified Assistive Technology Professional, who has worked with people with disabilities of all ages since 1991.